Like the sounds of it? You'll have to wait until at least 2021, as the $11,000-a-night cabin is already sold-out for the 2020 inaugural sailings. The suite centerpiece, meanwhile, is a $200,000 Vividus bed, custom-made by four master artisans at the Hästens workshop in Köping, Sweden. Easily the "most luxurious bed at sea," it's made with a pinewood frame, steel springs, layers of flax, horsetail hair, cotton and wool batting. Moreover, the bed required 300 hours of labor and 18 months to complete. How else do you up the ante in floating palaces? You also add an en-suite spa that includes a personal sauna, steam room, and treatment area that features Italian marble and gold accents. The two-bedroom suite comes with two-and-a-half baths. Décor includes "exotic woods," Italian marble and golden chandeliers and curated art sculptures. When you're plopping down $11,000 a night, of course you're privy to a personal butler who will coordinate spa activities, chauffeur services at ports-of-call and who will pick out your preferred linen, pillow, bath and skincare products ahead of time. 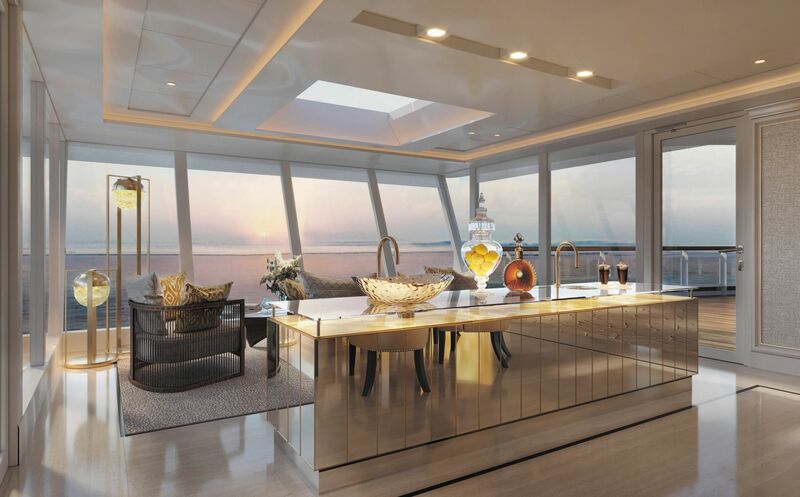 Other features include a 1,300-square-foot wraparound verandah and glass-enclosed solarium that offers guests a Captain's view of their ports of call. Seven Seas Splendor lifts anchor in February 2020 and will travel throughout the Mediterranean, Northern Europe, Asia, the Caribbean and North America.